Rosabelle is very poor on the morning of the 4th day since she spent all her money on a bed last night so she wouldn’t have sleep on a park bench. But there might be a surprise waiting at the library for her! Rosabelle needs to use the toilet really badly! Maybe buying a shower before a toilet was plum when there are free showers at the gym. She sells the shower for $220 and buys the cheapest toilet she can find which is $250, this leaves her funds at just $15. Today is her first day of work and at least she will earn some guaranteed money. After using her new toilet, she eats a (free) bowl of yogurt and she is feeling much better. After eating, Rosabelle goes to the gym to shower because she had to sell hers in order to buy a toilet. While she is at the gym she runs into a friend. Rosabelle arrives at the Burners & Builders Gym. After her shower she runs into Philip Montgomery and they dance together, but he seems bored. And what on earth is Rosabelle doing here? She looks like she is having a seizure! Yep! He is definitely bored with her when he doesn’t laugh at her funny story ! Rosabelle gives up on Philip, if she bores him now she cannot imagine spending her life with him in a very small house! 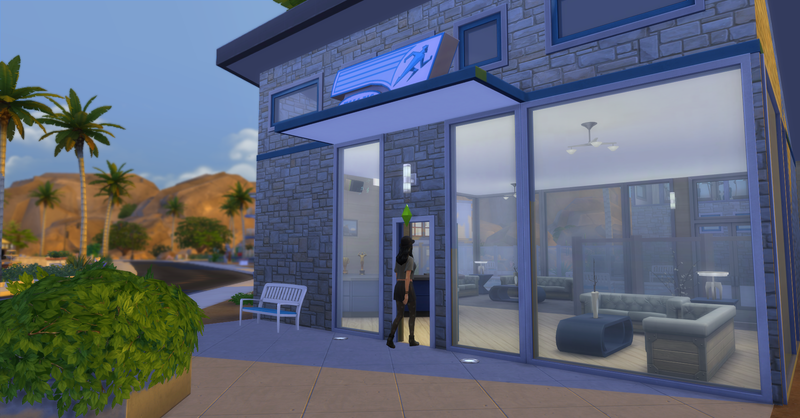 She then heads over to the Willow Creek Archives to practice writing before her first day of work! At the library, she meet the librarian, Pawel Lawton. He was wearing a very funny outfit though! He told her a funny joke and she laughed, they really seem to hit it off right away, despite the prison jumpsuit. Once Rosabelle is at the library there is very little time for anything besides learning a little writing skill and talking to Pawel, who is definitely potential spouse material. She learns that his traits are bookwork, like her! And neat, which is great. No matter how much they got to know each other or discussed interests it appeared that he only had 2 traits. 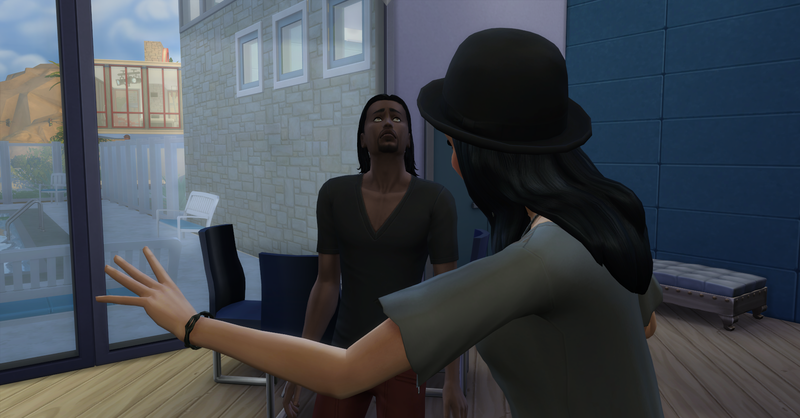 She chats him up while practicing writing for an hour and then she is off to her first day of work! Author’s Note: I popped into manage worlds and double checked in CAS if he only had 2 traits, and he did. 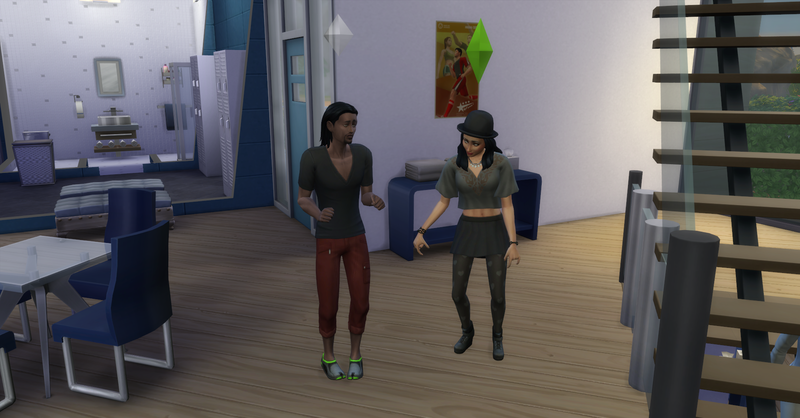 I wouldn’t have done this because I think it’s cheating to look at the aspiration and such in CAS but I have been seeing townies with only 2 traits popping up in other saves so I had a feeling. I gave him Creative for the last trait, it seemed to suit his other traits and personality. It also worked well with his aspiration, I am not going to ruin what that is because I couldn’t help but look, considering. But I tried to pick a trait I believed suited him and not just the game because I really liked him. I guess that’s what happens when you think the NPC librarian is hot! When she gets home she has earned $200 but it isn’t enough to replace to shower she had to sell this morning. Rosabelle is able to go collecting around her neighborhood when she gets home from work, afterwards she is tired and hungry. She eats a quick snack of yogurt and goes to bed.